Camellia has two teahouses in Kyoto: Camellia Flower (on Ninenzaka in Higashiyama, East Kyoto) caters for group sessions, and Camellia Garden (close to Ryoan-ji, North West Kyoto) provides private tea ceremonies. We kindly ask you to please check carefully which teahouse your booking is for. · Booking confirmations will include the relevant directions. · This page is for Camellia GARDEN, close to Ryoan-ji (NW Kyoto). Click here for Camellia GARDEN’S location on Google Maps. Please tell your taxi driver to take you to 'Ryoan-ji Temple'. As Ryoan-ji is one of the most visited temples in Kyoto, every taxi driver is very familiar with the location. If there is any confusion or problems, call us on 075-525-3238 and we will happily give him instructions in Japanese. Take a JR West Bus heading to Takao/Toganoo/Shuzan via Ritsumeikan University. Please get off at Ryoanji-mae bus stop (note that all signage on the bus is also in English, so you will be able to get off at the right stop). It takes about 40 minutes, and costs 230 yen (buses advise you to prepare the right change in advance as change is not always given on the bus). Take the Keifuku (Tram) Line from Arashiyama Randen Station to Ryoan-ji Station via Katabirano-Tsuji (change lines here). It takes about 30 minutes, and costs 220 yen. Again it is advisable to have the right change. Walk West along Kinukake Road for about 15-20 minutes until you reach Ryoan-ji (or take Kyoto City Bus #59 and get off at Ryoanji-mae bus stop). 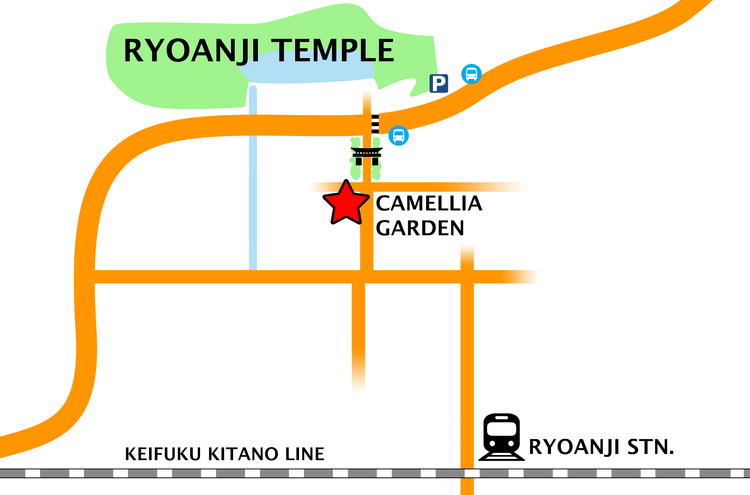 *Please note that there are not many buses that come to Ryoan-ji itself, most stop at the Ritsumeikan University terminal. From Ritsumeikan University it is only about a 10 minute walk along Kinukake Road. From the entrance to Ryoanji Temple (don't get confused with the adjacent temple carpark entrance), cross Kinukake Road and go down the cobbled path (flanked by trees) that leads through a gate (see photo below). As you emerge from the cobbled path we are the first house on the right, a large building with high walls. Follow the road downhill until you see the entrance to your right (when the wall ends). The walk should take only 1 or 2 minutes. Best if you show this map to your taxi driver. 18 Ryoanji Ikenoshita-cho, Ukyo-ku, Kyoto, 616-8003.